It's already March! I can't believe how fast time goes fast especially this year! Well, to start off this month, I will be doing a product review on Pinky Paradise. Just a quick side note that this review is based on my personal experience and 110% honest opinion. Here is a quick info of Pinky Paradise from their website. Besides eye makeup, choosing best circle lenses is the top priority of everyone to cast a gorgeous look at others.However it may be difficult for many to "choose" a brand of your lenses in this competitive market. Here I am going to review an online store "Pinky Paradise" from where you can make a confident purchase without any fear or hesitation. Pinky Paradise has largest collection of circle lenses in all the hit and lovely colors for instance blacks, brown, greys, blues, pinks, violets, greens etc. See the product details here. You can choose even from the variety of brands at PinkyParadise that give different hot looks to your eyes. The store also sells contact lenses accessories, eye makeup, face makeup and hair accessories. Shipment is done through Fedex and you may receive your goods just with in 4 to 7 working days. 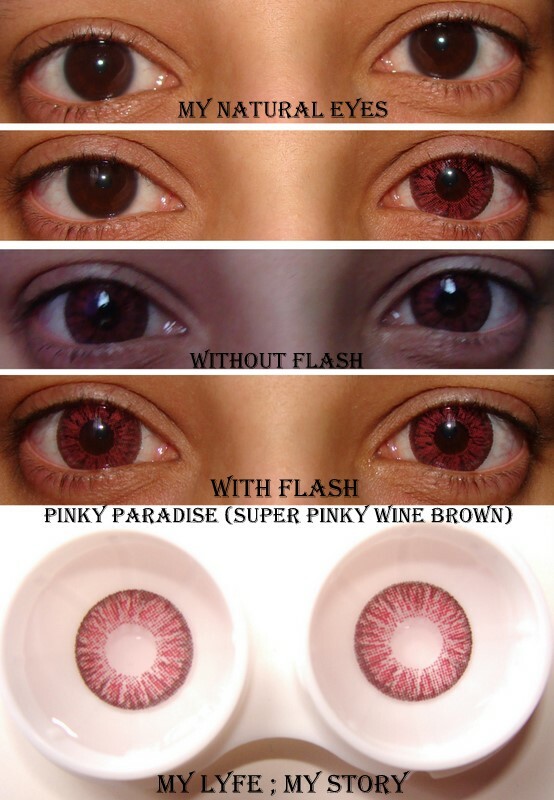 For the product review I chose the do a review on (Super Pinky Wine Brown 15mm) Contact Lenses. And down below are photos of me wearing them. Also, for these pictures I decided not to put any makeup on to emphasis more on the lenses rather than the eyes. I always believe red/wine coloured lenses were meant for Halloween, but I took my words back as soon I got a chance to try out the Pinky Paradise's (Super Pinky Wine Brown). The colour is so vibrant and it looks red (wine red) in normal lighting, but as soon as you go out in nature light the look stunning brown. The lenses are really comfortable. I am actually planning on buying more (Super Pinky Contact Lenses Collection) from Pinky Paradise. Plus, it doesn't dry out fast like my regular contact lenses. Overall, I would recommend this company and this (Super Pinky Wine Brown) contact lenses to everyone. 2. The coupon code can be stacked, If you purchase 3 pairs, you will get 3 lens case plus 3 mystery gifts. 3. A minimum of 1 lens purchased to activate the code. Also, I hope all of you have a fantastic weekend! FTC: Pinky Paradise sponsored the (Super Pinky Wine Brown) for my honest review. I was not compensated to make this entry and this is 100% my honest opinion.